Every week I think about vegetable pakoras. Deep-fried, piping hot chickpea flour (besan) fritter like creations that are full of minced vegetables. Served with a side of Maggi tomato ketchup. I had some delicious pakoras in Jersey City recently that were stuffed with chopped methi and coriander leaves and green chilli. 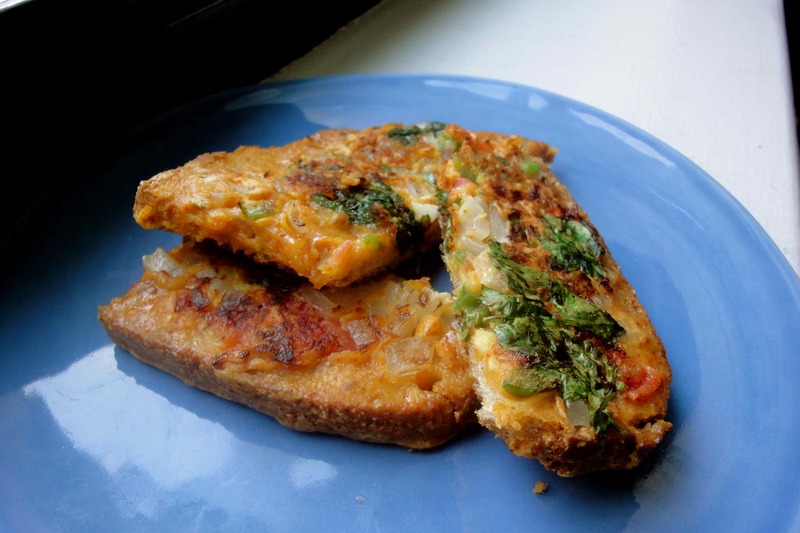 I will attempt to make them soon, but for the moment, my mother-in-law shows me how to make these toasts that are a more wholesome cousin of deep fried bread pakoras. 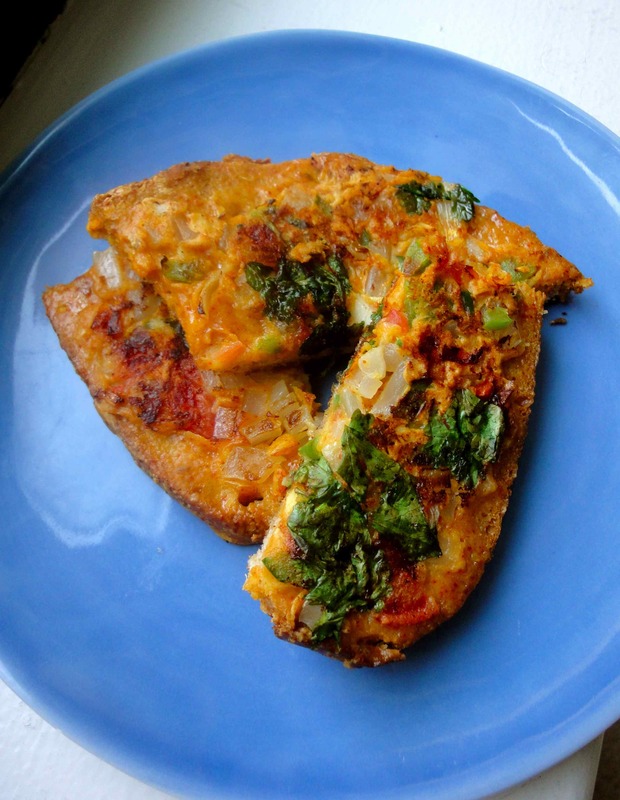 The bread is buttered on one side and placed on a hot griddle with the buttered side down, and then spread with a spiced chickpea flour batter that’s full of chopped vegetables like onions, green peppers and tomatoes. The flavor comes from minced ginger, red chilli powder, a pinch of whole cumin seeds and some finely chopped coriander. Try these at breakfast or at tea time or for a quick lunch. Any regular white or whole wheat bread can be used. 1. Heat a non-stick griddle. Butter one side of the bread and keep aside. Meanwhile, prepare the besan batter by mixing all of the above. Add water to prepare the batter cautiously – the water is usually 1/2 of the quantity of besan used. Add a few drops of oil to the batter, about a half teaspoon. The consistency should be medium-thick, similar to pancake batter. 2. Place one slice of bread on the hot griddle with the butter face down on medium heat. On top of the bread spread half the batter. Allow to cook on medium heat for a little while until the bottom side looks toasted. Spoon a little oil on top of the battered side. Flip over quickly, and continue to cook on low heat for a few minutes until the besan batter appears firm, golden brown and crispy. Serve immediately and enjoy hot with ketchup.